The photograph here was probably taken in June 1950 I believe. As to the names, I only remember a few. Front row: ?, ?, ?, ?, Father Flanigan (in the middle), Shelagh Hogan, Janice Prossor, Carol Broughton and ? Second row: ? (teacher), Miss Mahouteax, Roger Provost, Desmond Lynam, Michael Weller, ?, Francis Drake(maybe), Richard Black, ?, ? Fourth row: ?, ?, ?, Ann Fulgoney, ?, ?, ?, ?, ?. Fifth row: Don’t remember any names here. Click on the photograph to open a large version in a new window. Click again to further enlarge. Janice, please see http://www.bramhill.net for Prossor family history. After ages of it going around in my mind I still am half convinced that the blonde lady at the extreme left of the photo was Mrs Long the school secretary. I just seem to remember her like the photo. Hope somebody can throw some more light on the photo and identify the lady with the blonde hair. Hi Mick. I think you are right about it being Miss Long because I got into trouble when I was about 8 by calling her Miss Longlegs. The above photo is a bit of a mystery to me. Is the photo definitely a first holy communion photo, or could it have been a confirmation photo? I wonder if there were two photos taken on the day. Most of my classmates are in the photo but I am missing- Melvin Hanson an Indian lad is also missing. Myself and Melvin stayed together for that occasion most of the day. I can fill in a couple more names. On the left of Michael Weller and on the shoulder of Father Flanigan is Joe Downey who was in my class until we left in 1958. Third row up and second boy from the left (above Desmond Lynham) is Geoff Macklin. The nuns are from left to right-Sister Gertrude-Sister Carmella, (very kind) and Sister Mary Of Mercy who never showed any mercy at all, strict and cruel. Mr. Beech also in the photo was my class teacher at the time. I think that it might be me in front of Mr Hogan in the 5th row. 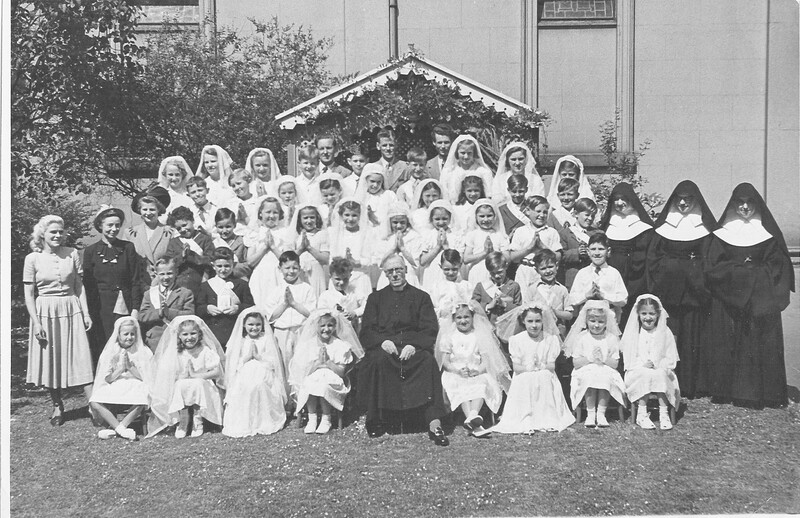 I started here in 1964 and so remember Sister Gertude as she was my class teacher (had that lovely innersole of a slipper she used as punishment – have a soft spot for her anyway!) and Sister Mary of Mercy. Also Mr Hogan the head at the time and also Mrs Chew. The picture reminds me of my first Holy Communion and having the photos taken in the garden. Anyone remember the year some of us where stranded at school over night because of the really bad snow storm? I have never seen Sister Gertrude show even the naughtiest kid any nastiness. The nasty one was Sister Mary of Mercy, very spiteful nun, never saw her smile for a nano second.